In Part I of our series commemorating the 50th anniversary of the Freedom of Information Act (FOIA), we covered the origins of the Act and its major amendments, processes, procedures, exemptions and exclusions. In Part II, we take a look at the various types of FOIA requesters, turnaround times, and more. Who Receives the Most FOIA Requests? The number of FOIA requests submitted to federal agencies has steadily increased over the years. In March 2016, the Department of Justice’s Office of Information Policy announced that government agencies processed nearly 770,000 FOIA requests in 2015. The top agencies to receive FOIA requests in 2015 were the Departments of Homeland Security, Justice, Defense, Health and Human Services and Veterans Affairs. Commercial-use requesters: individuals or companies requesting records in order to further their own, or another party’s commercial, trade or profit interests. Noncommercial requesters: including educational institutions, noncommercial scientific institutions and members of the news media. All others: a catchall category for individuals and companies who don’t fit into the first two categories. Federal agencies have 20 working days to respond to the request. However, this usually means they acknowledge the request within 20 working days. It almost always takes them longer to actually issue a final response. An agency may cite “exceptional circumstances”, such as the scope of the request or the agency’s FOIA backlog, in communicating an extension to their response time. Per the government’s 2015 analysis of FOIA response times, it takes from one to two-and-a-half years to answer requests. Agencies frequently cite FOIA exemptions and withhold information in their final responses and information may be deleted or blacked out. The most frequently cited FOIA exemptions are Exemption 6 and Exemption 7(c), which protect personal privacy. Information issued in response to a FOIA request is usually, but not always, considered public information. An agency may release records that contain sensitive information only to the requester. The FOIA requester’s name and the nature of their request are considered to be public information and will be listed in the agency’s FOIA log. If a requester is unhappy with the agency’s final response or with the amount of time the request is taking, they may appeal to the “FOIA Ombudsman”, the Office of Government Information Services (OGIS). The OGIS assists in resolving disputes between requesters and agencies. If a requester is unhappy with the agency’s final response, they also have the option of appealing. The appeal must be filed within 90 days of receiving the final response. An appeal can be mailed or, in most cases, emailed. There is no fee to submit an appeal. FOIA requesters have the option of suing the agency should both their request and their appeal fail. The U.S. Supreme Court has decided several notable cases regarding FOIA requests. Under the Privacy Act of 1974, 5 U.S.C. 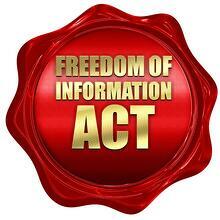 § 552a, individuals can request access to their own records as maintained by the Federal government. The Privacy Act also requires that the government obtain the written consent of an individual before disclosing records about the individual. However, there are exceptions to this requirement. Agencies have responded to some unusual FOIA requests over the years, including a request for complaints at the CIA’s cafeteria and the FBI’s dictionary of Twitter slang. All fifty U.S. states have versions of the Freedom of Information Act which allow citizens to request state government records. Some states, such as Arkansas and Virginia, only respond to requests from state residents. Arkansas agencies even take the step of requesting identification from would-be records requesters. At least 95 countries worldwide have some variation of a ‘right to information’ law. Sweden is said to have enacted the first such law in 1766, followed by Finland in 1951 and then the United States. As you can see, a FOIA request can quickly become complicated. Diligent and time-consuming follow-up is often required to ensure you get results quickly. Before you file, you may want to consider using an experienced service company to file on your behalf to ensure you receive the documents you need.